Anorexia Nervosa is a disease marked by the pathological fear of weight gain leading to rapid or extreme weight loss. 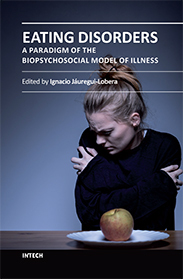 Victims with anorexia restrict or limit their intake of food, as well as their behaviors in life spheres beyond food and eating. As an example, an anorexic young adult refused to go to her roommate's wedding because the ceremony was to take place at precisely the moment when she would need to be eating dinner. She did not have the flexibility to diverge from her daily schedule; and so her life became severely compromised. Another anorexic woman ate the same limited number of foods every day of her life in the same order and in the same amounts; she felt compelled to wear the same few items of clothing as well. Anorexia is a condition that describes the refusal to eat. It should be noted that the refusal to eat could be based on many different factors. Anorexia nervosa is a condition that implies an effort to resolve emotional problems through the misuse of food. Anorexia, per se, is a term that describes the inability or refusal to eat for reasons that are other than emotional. It also implies a genetic propensity to develop this disorder through the clustering of genes, as well as mood alteration and, potentially, the inability to concentrate and learn. Anorexia and bulimia are the most lethal of all the mental health disorders. Three distinct aspects of eating dysfunction must be in place for your child's behaviors to qualify as a clinical eating disorder. There are 11 million victims of anorexia and bulimia in American today, 87 percent of whom are below the age of twenty. There are ten times as many female sufferers, though during the past decade, the number of males with anorexia has doubled. Anorexia has been called a "rich girl's" disease, though the fact is that this eating disorder is prevalent among all races, cultures and ethnic groups that are upwardly mobile, including African Americans, American Indians, Fiji Islanders, etc. Children as young as age five are now reported to suffer from anorexia, displaying such symptoms as compulsive exercise, food restriction, vegetarianism, etc. Why do people develop anorexia? Anorexia is caused by the merging of environmental factors in an atmosphere of physiological susceptibility. Children may be born with a predisposition to developing anorexia through genetics and temperament. There has been shown a direct correlation between inherited addictions and the development of clinical eating disorders, including both anorexia and bulimia. Other predisposing factors that are environmental in nature may include the influence of peers and the media, childhood abuse, as well as communication and problem solving patterns in the family. Families don't cause eating disorders; even the healthiest functioning families cannot be assured of protecting their kids from an eating disorder, either. But, when parents teach children to recognize and respond to their feelings in productive ways and to become effective problem solvers, these skills will go far in creating resistance to eating disorder onset and/or in facilitating more expedient healing, even in a genetically susceptible child. In addition, the nature of one's eating lifestyle (healthy or not so healthy) will have a great influence on whether or not a person may become a victim of extreme, disregulated or dysfunctional eating habits or obesity later in life. Are parents responsible for causing anorexia? There is no direct correlation between parenting and anorexia, particularly because genetics play the single most significant part in disease origin. However, parents are largely responsible for shaping a child's attitudes about eating, body image, weight, and weight management and about establishing a healthy eating lifestyle during the growing up years. Parents are their child's best teachers and role models. Most importantly, they are the best observers of their child; through early disease detection, parents can most effectively stack the cards in favor of prevention and a timely and lasting recovery. Parents belong in their child's anorexia recovery in an enlightened and supportive way, particularly when the child is young and living at home. What are the myths and misconceptions connected with anorexia? all anorexics are thin or emaciated. These statements are not true and can divert an observer from making a skillful diagnosis and becoming proactive in protecting a child's life and life quality. Anorexia is 100% curable in 80 percent of cases that are detected early and treated effectively. In 50 percent of cases, anorexia is so completely curable that food and eating cease to be an issue for the individual. In the other 30 percent of cases, anorexia is totally curable, though the patient may need to stay in treatment or return to treatment on an as-needed basis in order to stay on top of the underlying emotional issues that may have initially driven the onset of disease. How can you recognize anorexia when you see it? The earliest warning signs of disease-in-the-making are more likely to be seen in the child's mood, attitudes, fears, and preoccupations than in weight or food-related behaviors. By the time your child has begun to show physical signs of losing weight, the window of opportunity for prevention may already have passed. Paying special attention to your child's or loved one's emotions will give you a window into your child's emotional and behavioral future. Eating disorders are more likely to present themselves at home than in the doctor's office, so the responsibility for early diagnosis lies with parents and families. Recovery from anorexia results in the development of emotionally healthy and functional children with the capacity to grow up to become emotionally healthy adults. With recovery, kids get their personality and their life quality back; at the same time, their parents claim to "get their child back." 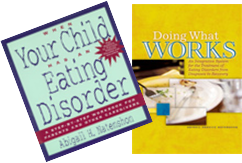 When Your Child Has an Eating Disorder: A Step-by-Step Workbook for Parents and Other Caregivers (Jossey Bass Publishers) will guide you in your efforts to help your eating disordered child regain his or her good health. Do you see anorexia in yourself or in your child? The following is a short quiz to help you consider whether or not you or your child may have a problem that could develop into anorexia. Do you worry excessively about your appearance? Do you spend a lot of time on preening, grooming? Trying on clothing in seeking the most flattering items to wear. Do you eat or restrict certain foods just to improve your appearance? Do you use behaviors around food and exercise to relieve or resolve anxiety, depression? Are your behaviors around eating and exercise compulsive, inflexible in any way? Does excessiveness or extremism show up in other life spheres as well? Do you notice depression, moodiness, social withdrawal? What should you do if you suspect that your child has anorexia? Know what you are looking at. Talk to your child. Discussing an existent problem won't make it worse, but by defining it as such, can make a solution possible. Remember that eating disorders are a misuse of food to resolve emotional problems. If eating or exercise behaviors serve to diminish anxiety or depression, or if they double as pseudo-solutions to emotional problems even as they address issues of hunger and satiety, it's time to seek out more effective ways to solve problems. Professional treatment for anorexia will best involve a multi-disciplinary team of professionals, including a medical doctor and nutritionist, as well as a psychotherapist who is steeped in cognitive-behavioral and psychodynamic psychotherapy and family systems theory, and who is proficient at facilitating family treatment.